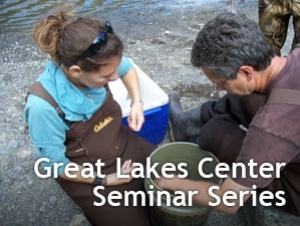 The Great Lakes Center (GLC) is holding a graduate seminar this fall featuring scientists and environmental experts from all across Western New York. The speakers will discuss research and conservation efforts taking place locally. Students, staff, and faculty with an interest in local ecology are welcome to join the graduate students enrolled in the one-credit seminar. The series reflects the important role the center plays in many local environmental efforts. The seminar is a required course in both the master’s programs offered by the GLC; it exposes students to a range of agencies and organizations with which the center’s scientists collaborate. “We are grateful to everyone who is participating,” said Kelly Frothingham, coordinator of the Great Lakes Ecosystem Science (GLES) graduate programs. The GLES master of arts program prepares students for advanced research, further graduates study, or employment. The GLES master of science program is a professional science master’s program that prepares its graduates for management positions in fields relating to the Great Lakes ecosystem. Programs that are designated “professional science master” are, broadly, intended to prepare students for leadership positions in STEM-oriented companies. September 22. Natural Flow Regime Application to New York Rivers and Water Levels of Lake Ontario. Speaker: Darran Crabtree, director of conservation programs, Central and Western New York Chapter of The Nature Conservancy. October 6. New York DEC's Approach to Great Lakes Challenges. Speaker: Donald Zelazny, Great Lakes programs coordinator for the New York State Department of Environmental Conservation.